I had fun with this chart - using a variety of fibers and stitched on linen burlap over two. 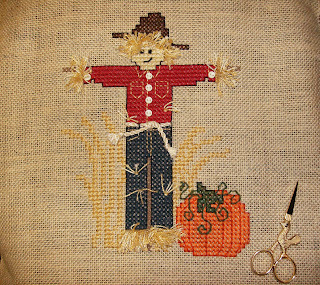 I used turkey work for the "straw" hair, hands and feet and the little tufts of "straw' sticking out through his clothing. One of these days he'll be a "real" stand-up guy! Just found your site via Deb. Love your patterns, this one in particular. I can't wait to look around a little more. Welcome back! 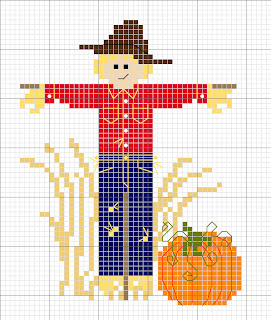 Your scarecrow is really pretty. This piece is so cute. Did you design it? Thanks, everyone! Yes, Barb, I did design it - I enjoy designing as much as stitching. I'm glad that others like my designs - I plan to keep it up as much as I can. Thanks, again! Just found your site through a Yahoo Cross Stitching Circle of Friends group member. I think I will visit often and thank you for the dragonfly and pumpkin patterns. God Bless. Hello! Thank you for this pattern - I used it to stitch a gift for my sister! That is so cute! The fabric is perfect! Thanls for sharing!